1. Worn tires As tires get old they can harden and lose grip and don’t stop your car as well, maintaining your tires properly could save a live, maybe yours. Also according to the Rubber ManufacturersAssociation, every time the outside temperature drops 10 degrees Fahrenheit, the air pressure in your tires goes down one pound to two pounds per square inch making driving more dangerous. 2. Batteries: A weak battery can leave you stranded - possibly at the worst time and place. 3. Brakes: An expert inspection can determine whether your brakes are functioning properly with full braking capability. 4. Windshield wipers: Old or worn windshield wipers can lead to poor visibility in adverse weather conditions. 5. Headlamps: Properly aimed headlamps are a must for optimizing your visibility - both your seeing and your being seen. 6. Fluid levels: Improper fluid levels - including coolant, oil, power steering, transmission, brake fluid and even washer solvent - can negatively affect vehicle durability, performance and safety. 7. Belts and hoses: A broken belt or ruptured hose can cause costly engine damage and travel delays. 8. Engine Oil: Change your oil and filter at intervals recommended in your owner's manual to minimize engine wear and reduce the possibility of internal damage. 9. Your vehicle investment: Ok so this may not be life threatening but what’s your excuse for not maintaining your 2ndlargest investment? Make maintaining your car easy on YOU, download Oil Change the iPhone app and keep it simple and easy. 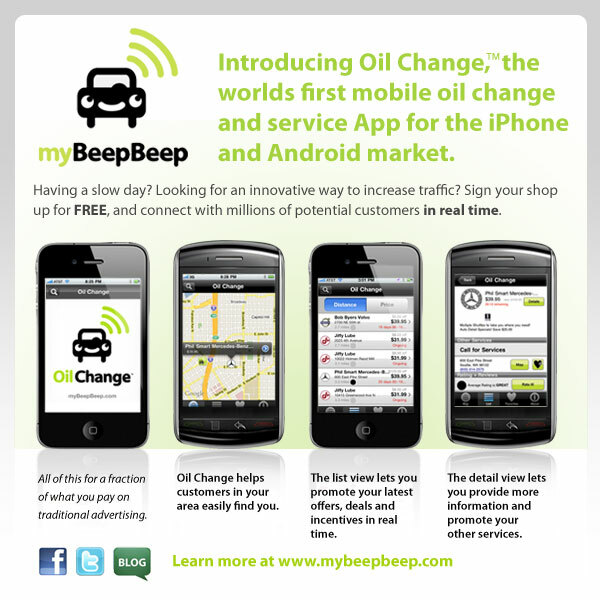 Visit www.mybeepbeep.com to download the iPhone and Android app "Oil Change" today and find the best shop and best deal on an Oil Changes and other auto service needs. Amazing details. Thanks for sharing. Keep updating your blog.